Keepin' Up With the Joneses!! My husband and I live on a 6 acre lot in a rural subdivision in South Central Missouri. 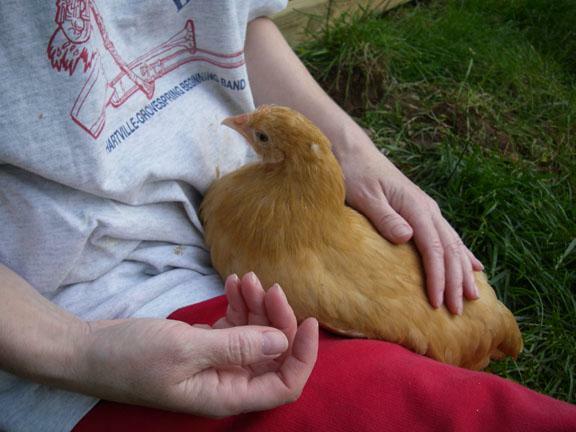 We live among the best neighbors in the world and having chickens is not a problem at all. 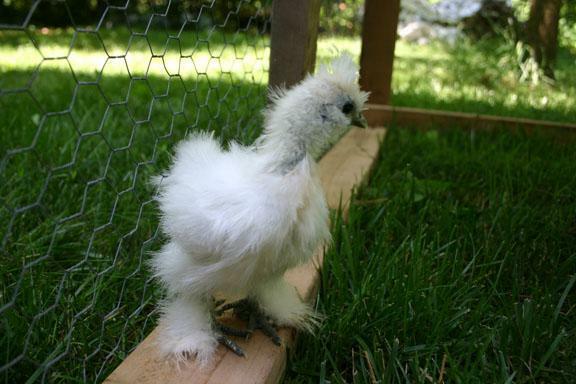 As a matter of fact, two doors down from us have been raising chickens for several years now. 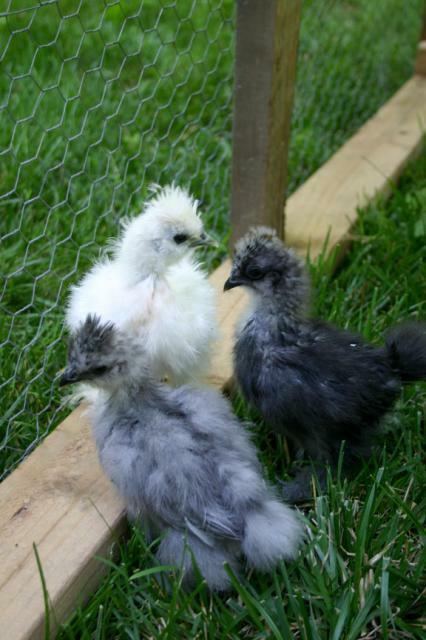 They have been great resources in getting started on a flock of our own. 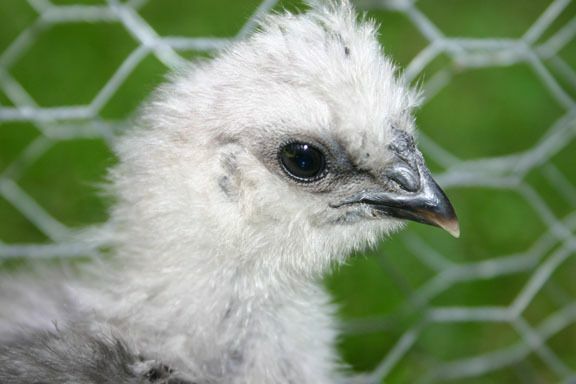 We still don't have any chicks as we both have full-time jobs, this is our busiest time, and we are still in the process of building the coop. 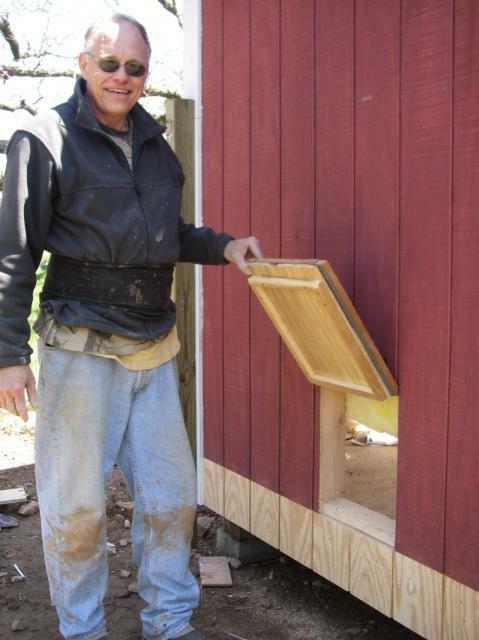 We love the experience of building the coop! We are one of the rare couples that really do get along well doing projects together. Our only hold up is time, so we decided to make sure we didn't add any pressure to the building of the coop as we want to do it right. My husband loves his 40' X 50' fully insulated shop and is in hog heaven anytime we are working out there. It's a great place for him escape from the world for a while. He also loves doing these projects because it usually means brand new toys for him. He's just a big kid at heart! Gotta love him! The beginning of the floor!! We are so excited! Measure twice! Cut once! 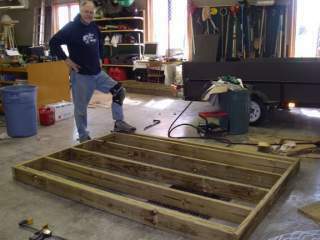 Floor frame complete. Yippee!! 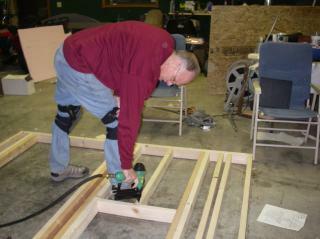 Attaching the frame to the skids (4 X 4s). Putting the Advantec sheets in place. We do have three walls complete as well. However, pictures will be a couple days away! Must sleep now! Hope you enjoy watching our progress. The most difficult wall for us. A window and a door! AGH! The four walls are up and it's so cute. We are getting so excited. A picture of the inside. Pretty plain right now. More interesting later. 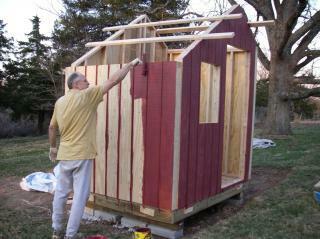 Decided on Cabot Barn Red Semi-Transparent Stain. First coat is going on today. We ended up putting an additional coat on the coop since it worked out that we were half a side short of having enough to finish it all. So since we had to get an additional gallon of stain, I swear that is a conspiracy! hee hee, we just went over it again. So glad we did. It looks so much better. Hopefully we can work on the roof over the next few days. Falling asleep standing up! They were so tired the first day! So funny to watch! 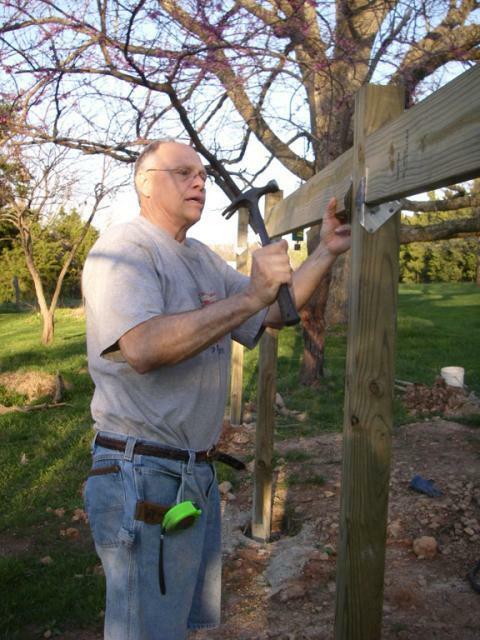 We also were able to work on the coop quite a bit this weekend. 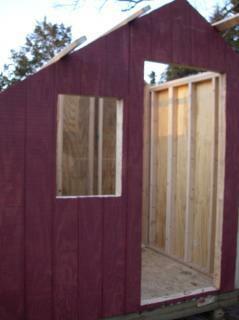 We now have a roof and a window and door. Thanks to a couple of amazing Amish helpers on the roof and my very talented husband who did the window and door. 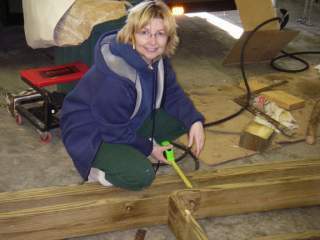 I also did the nesting boxes while Gary did his jobs. It was so fun! AND....I still have all of my appendages! I also need to clean up my camera lense. I keep it in my pocket when I work and it often gets dirty. That's why some of my pics have spots. 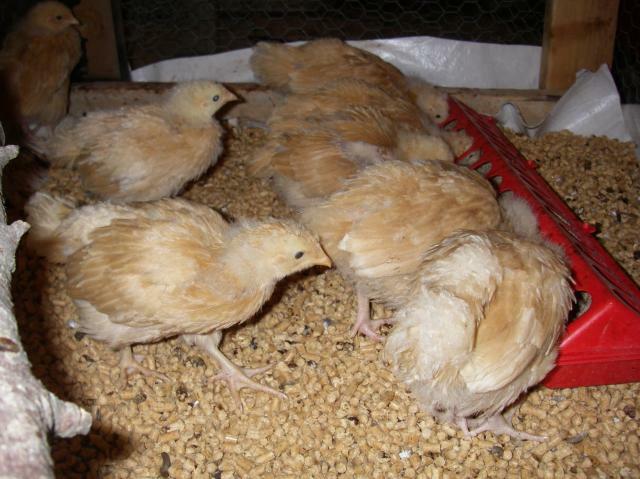 Found 12 more Buffs on Craigs list and they are pullets. So we went for it and got them tonight. They are all doing very well. 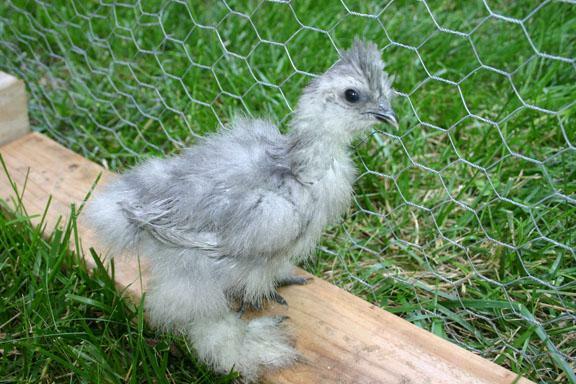 A bit more vocal than they others, however, they are very docile and sweet. More later. Gotta sleep! Way past my bedtime. This week has been so much fun! 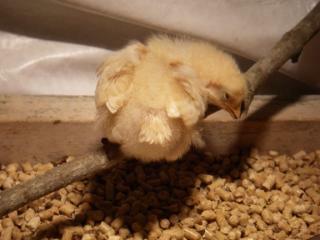 I noticed that the chicks were jumping up on top of the mirror we placed in the brooder and so I thought they might enjoy a perch. 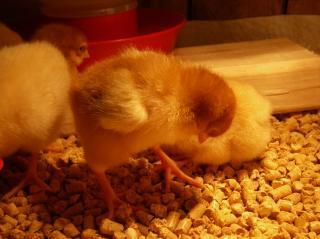 We also noticed at day 9 that the little boogers were growing so much faster than I expected. So we had to add on to their chicken condo. 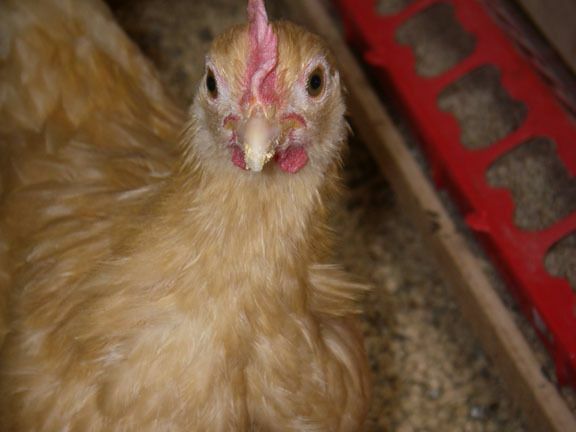 They now have an additional 8' X 3' brooder that we threw together Friday evening to prevent them from getting a bit testy with each other. They have actually been doing very well. 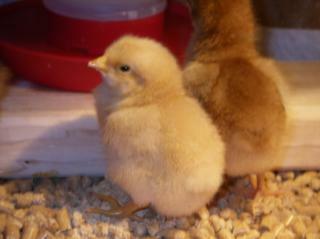 We cut a hole in the side of the brooder and opened it up to the babies. We added the two perches and whah lah! They love it! This is their first peek into the new condo. Aren't they adorable!! And the first trip down the ramp. They have now gotten so good at using the ramp the literally fly, run, slide.... in and out playing. They're so brave. The other thing I love about the new addition is that I can get in with them and play with them. I'm really trying to get them to be used to me. Today, I sat in with them twice and by the end of the day, Two or three of them are brave enough to come up to me and walk into my hand. Several will lay down and sleep in my hand. 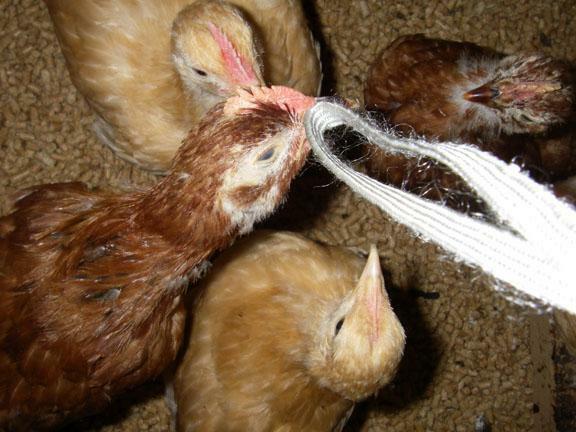 Hopefully, this process will help them to become friendly and maybe even look forward to my daily visits to their coop. 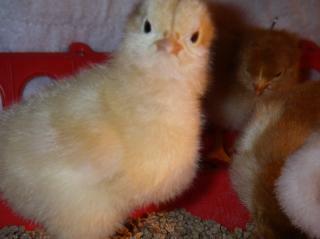 Oh yeah....I didn't tell you that we now have 10 more RIR pullets from Estes Hatchery. So, let's see.....we had 32, but sadly lost one of the ones we found on Craigs List. But everyone else is doing wonderfully. 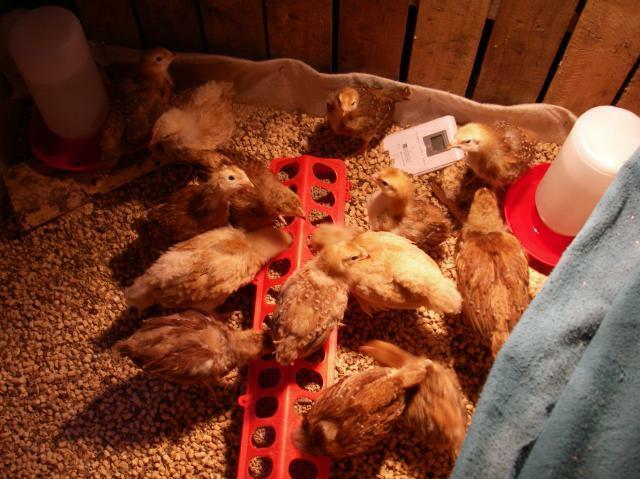 31 chicks and a coop meant for about 20! Hmmmmm. Something has to change. Guess we'll cross that bridge when we get to it. Finally time to update our progress. Life has been very busy for me with music contest, but now that districts are over, I can get back to taking care of my "babies". They are growing so quickly. 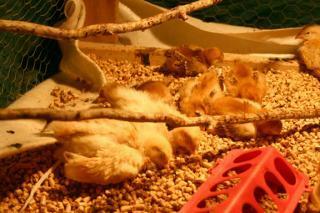 The enlarged Chicken condo is still a big hit for chicks and for "mommy". I love being able to sit with them. Several will run to me now when I get in with them. I was hoping for a calm warm day this weekend to let them outside for a bit, however, the weather didn't cooperate and it's seems that it is going to be a while before it does. As far as the coop goes, we are still working on it as we can. 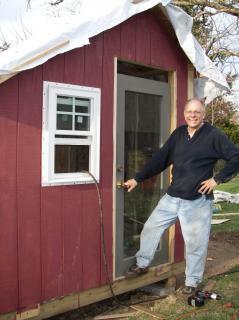 We are reversing the door as I decided I wanted it to swing out and not into the coop. Our awesome neighbor came over and dug some holes for our poles in the run. So next weekend should be pretty productive as far as finishing up a lot of little jobs inside the coop and then setting the posts for the run. We kept the younger RIRs seperated from the others for about a week and a half. Just chicken wire between them. Took out the wire this weekend and they have done great together. Haven't seen any problems at all. They seem to really like each other actually. 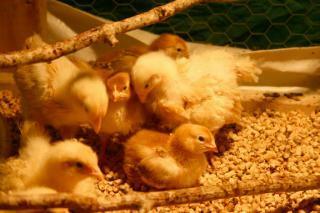 They sleep in little groups through out the brooder and are behaving nicely. 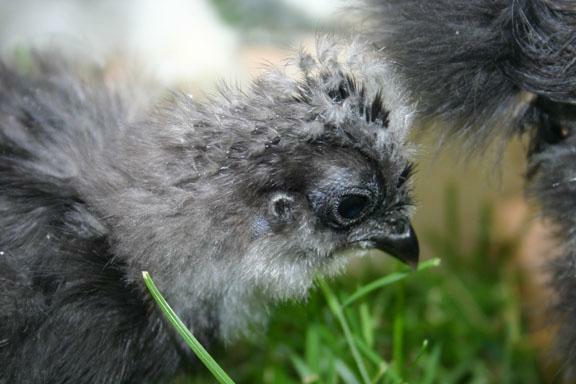 You can really tell the older chicks in the photos. I'm still amazed at how quickly they grow! Here's are some updated pics since my last entry. I'll have more to show you in a week. Happy Easter! Remember, it's about Jesus, not the Easter Bunny! (Although, the Easter Bunny is cute!) Have a great week! Long weekend = lots of worktime! (Or so we thought!) The weather didn't exactly cooperate. We had a three day weekend home and one gorgeous day and two rainy, dreary days. However, we aren't complaining because we got to spend time together that we don't often have, so....rain or shine, we had a blast. 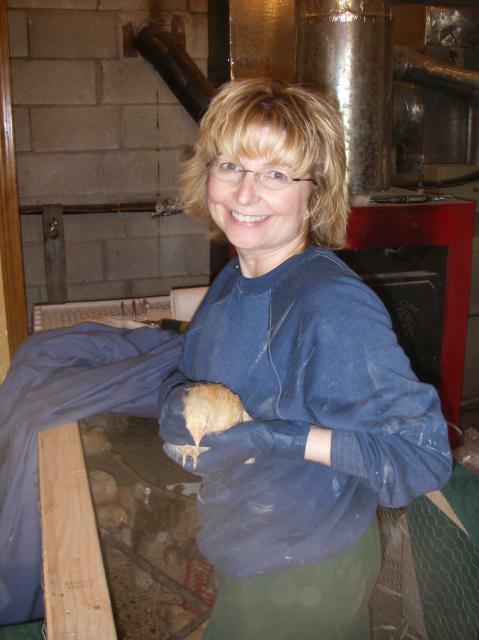 Worked on our coop when we could. Here's the update in pics! Enjoy! 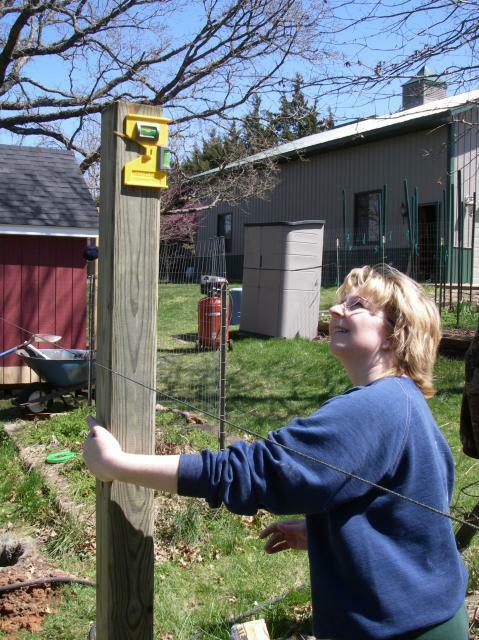 We set posts until we ran out of concrete and energy! For amateurs, I think we did very well. 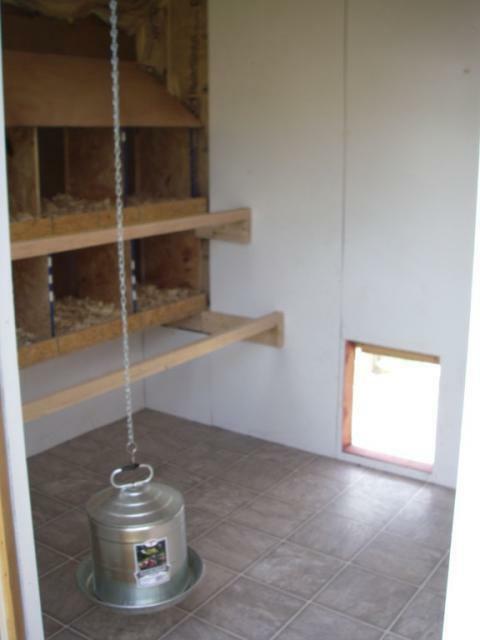 We finished a lot of odds and ends inside the coop over the weekend. Pop door done, just needs hardware. Finished adding the trim to the base. 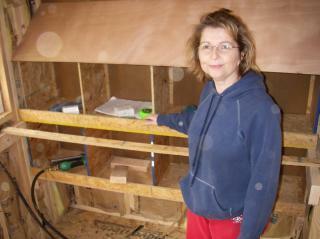 Built the roosts and my DH finished enclosing the space above the door. It will actually lock now. The door we bought came with a dead bolt in it, therefore, we have a very secure chicken house from the front. Our babies got the chance to spend a few minutes outside and experience the great outdoors. Or at least the square pen we kept them in while out. We took the Buffs out first and they went crazy. Then the RIR, totally different, then didn't seem to enjoy it at all. We only left them out about 10 minutes. 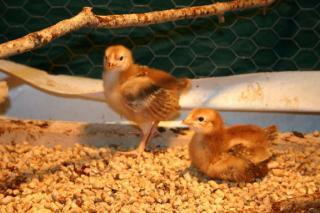 Didn't know exactly how long they should be out being only 3 1/2 weeks old. 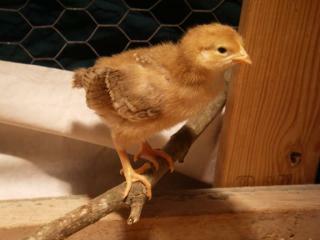 The reason why we are frantically trying to get the coop done. All they do is EAT!! 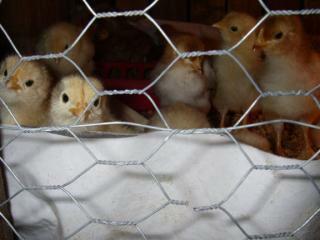 I just finished our weekend cleaning in the "chicken condo" and I am again amazed at how big the "girls" are growing. (I know....now that seems to only be wishful thinking.) I believe I have at least 4 roos among my 31 "girls". I took more pics today as always. Maybe you can help me decide if I'm right. 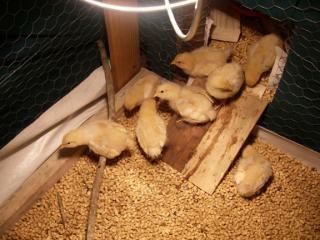 The larger ones are 4 1/2 weeks old and the smaller 3 1/2 weeks old. 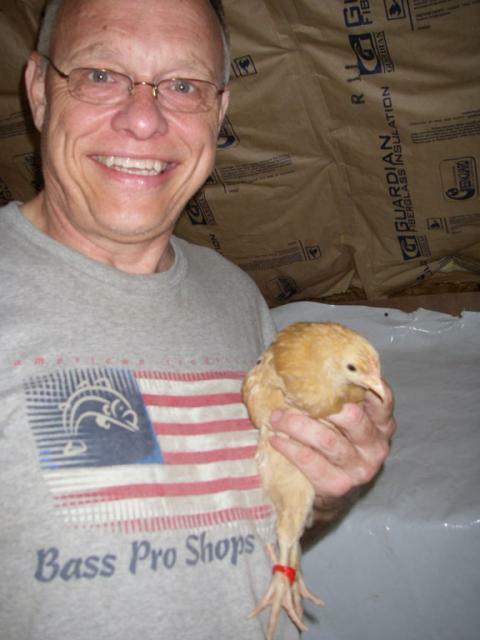 My DH and my Dad worked Thursday bringing electricity to our coop. I'm so excited! Now I have motion lights that will come on when I go out to feed as well as lights inside and on the run. 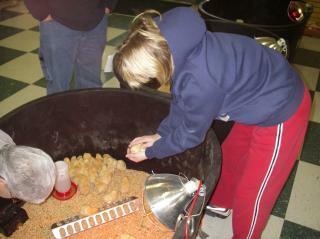 The inside lights we put on a timer for times when we feel we need to have a little heat inside the coop. My Dad and DH did great. More pics later! Yesterday was the BIG DAY! The girls made the move to the newly finished coop! The clean perfect coop before inhabited! The first release! The portable perch was an invention of my DH which has worked out great. We just moved it to the new coop and the girls are very comfy on it! Gary is holding "KFC". 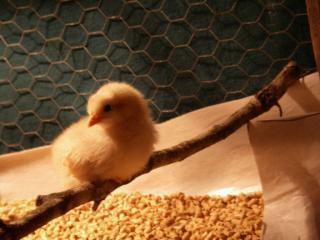 A chick who is really friendly. DH built a wonderful ledge for the food trays. It is working great. 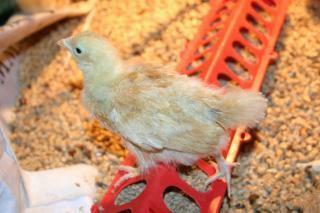 No poop in the trays and very little pellets. Yippee!! The new waterer is awesome. Taking pictures and the girls went nuts for the camera strap! They're so funny! We made great progress this weekend on the run. 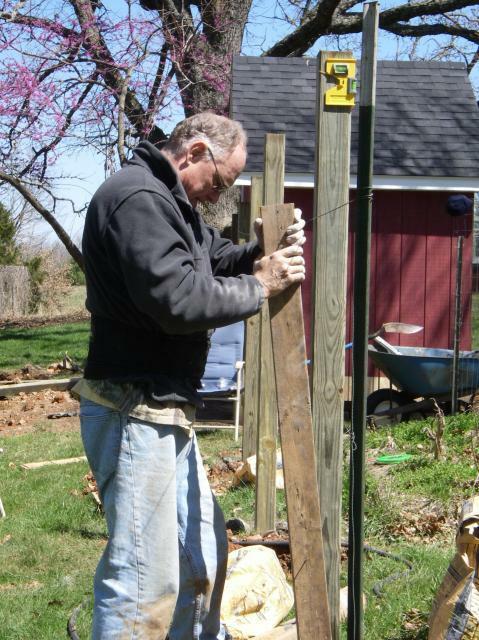 All posts set and the vertical beams in place. Even got the fencing on the north side of the run. Probably the only progress that will be made for a few days. We have rain in the forcast for the next week. So we'll get back to it in a week or two. 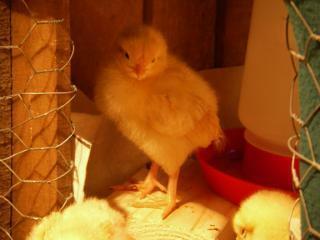 The chicks are going to stay inside the coop for a week or so anyway so they will learn that it is their home. I've read that is the best way to teach them to go inside at night. It's been a while since I've updated my site, however, the end of the school year was a bit hectic which left little time for the "fun stuff". Anyway, we have been able to finish up a lot of things since my last entry. Where to start.... We have completely enclosed the run and it is wonderful to have the outside all day and not worry about their safety. We are still working on adding the wire at the bottom and burying it to make it even more safe. We won't leave them outside at night at all. We know we have racoons in our area and don't want to take the chance, so in they go! 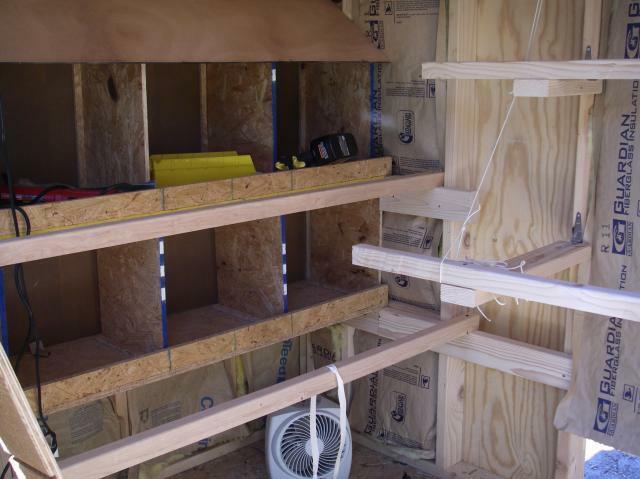 Gary has also done a great job creating "poop trays" under the roost and found a way to run a fan safely during the day. We now have a thermostat to make sure the temp stays comfy. 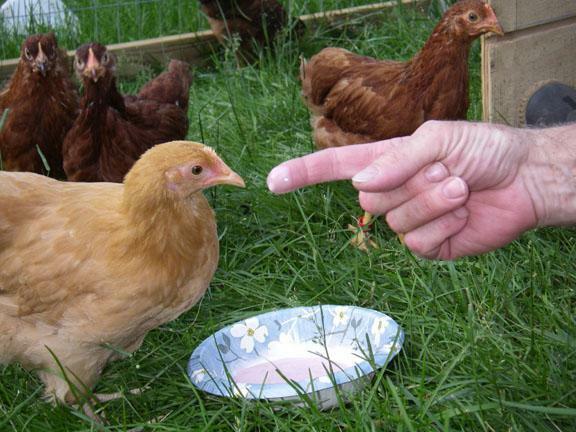 We did have the water suspended from a chain and found that our chickens bumped into it too often and it would spill. So DH once again solved the problem and made a little box for the water to sit on. We just added a spring to the gate on the run last night. Ask DH why we needed one!! 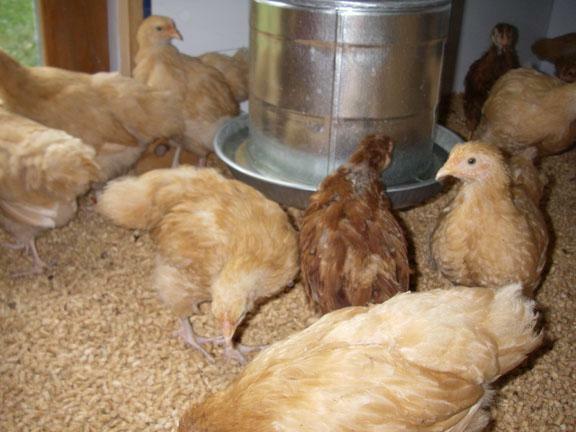 Came home from a VERY quick trip to town to find all 17 chickens out in the yard, the garden, etc. Needless to say, someone isn't very good at shutting the gate. Now it's not a problem. Gotta lovem'! 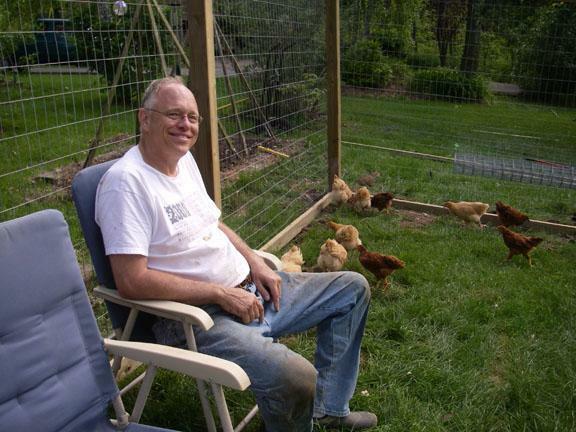 Gary and I had no idea how much fun raising chickens would be. We absolutely love that they get excited when you go out to see them. We love that they love to jump up in our lap and settle in for a nice nap. We used to have "family time", when we talk about our day and just reconnect after a days work, in our house. No longer! It's now in the chicken run with a lap full of chickens. Life is good. Below are some more recent photos. We seem to have missed the call on one of our roosters. Thought we had given them all away. However, Roodee excaped under our radar. He'll have to go soon. (But what a cute photo!) We have been experimenting with treats. I haven't found anything they don't like yet. Gary was trying to get them to try the yogurt in the photo below. Finally, you can see the two of us, chillin' with our peeps! The chickens are Big! I will be getting new pictures of them online possibly tomorrow. 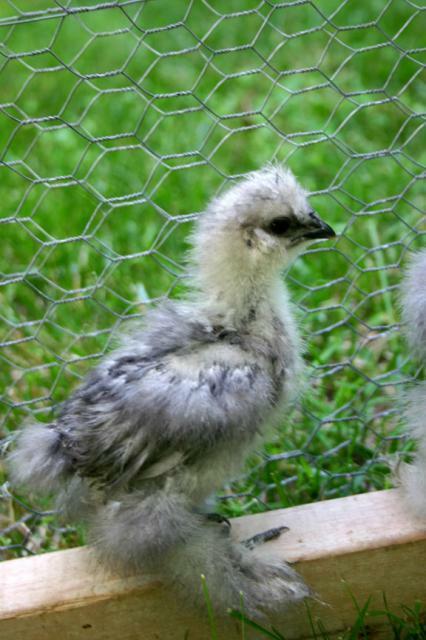 Our plan was to have only hens, however, Rudy still managed to stay below the radar on the last rooster give away. He has made his presence well known now. I just returned from Chicago to hear him crow for the first time. My husband and I were both very suprised. 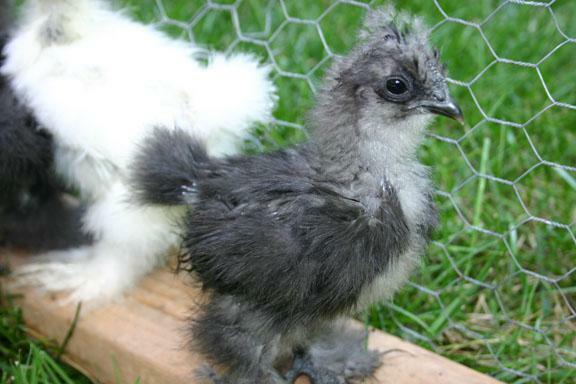 I got 6 silkies about 4 weeks ago. 2 whites, 2 splashes and 2 blues. They're adorable. These photos were taken yesterday and all but one (the last picture) is 4 weeks old. The little one is three weeks old. This was their first outdoor adventure! They were so cute. They didn't want to get their feet in the grass! After about 15 minutes, they finally decided it was ok.
Nice job! Your girls will be very happy. I would definitely add more ventilation. But nice build. I like the size of your run. Anyone building this coop in the future should keep in mind ventilation, light, space, and ease of access. I can see your joy in your build and your chickens. 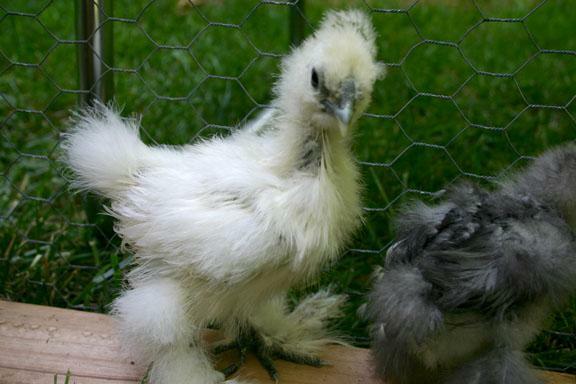 Buff Orpingtons are the sweetest! Wonderful coop and story. 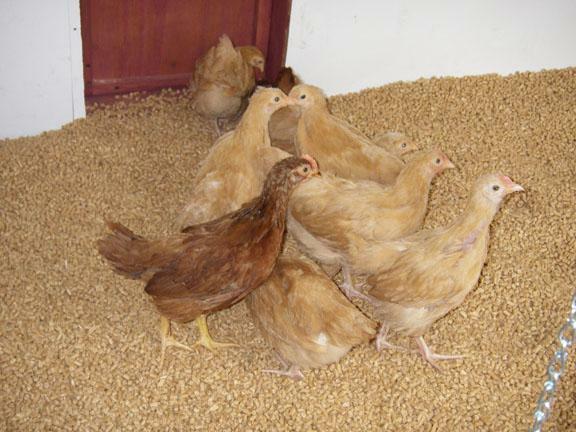 Did they all turn out to be pullets? Thanks for sharing! 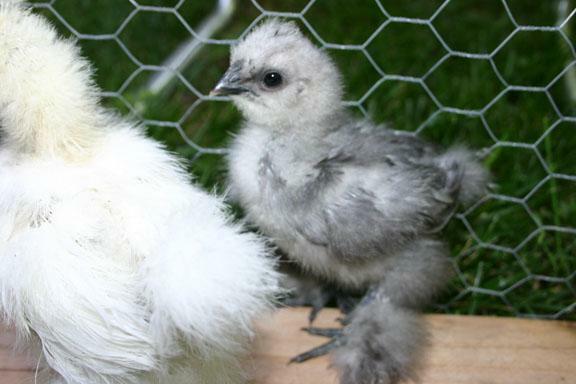 Love your coop and the story with it! Do you have an estimate on how much of all that costs? Thanks!